My husband and I have an annual "discussion" – he likes to mow daffodils down right after the blooms pass and I think that's too early. So far he's won! Who's right? It might be best if you just hand this article to your husband! Never prune back daffodil leaves until they are completely spent, which is 6 to 8 weeks after the flowers die. The correct time is when the leaves have yellowed and withered, which you can tell if you can slightly tug on the shriveled leaf and it comes right off. You can go ahead and cut back the spent flowers after they have passed without hurting the plant. Daffodils rely on photosynthesis which converts light energy into chemical energy and stores sugars that strengthen and feed the bulbs to ensure a hearty return next year. The photosynthesis process continues for up to two months after the flower has passed as long as there is ample sunlight and water. If you cut off the leaves prematurely, the daffodil plant will not have had enough time to store energy, the blooming next year will be weaker, and after a few years they will be gone. Some gardeners like to tie up green or yellowing leaves to tidy up their garden. That is not a good idea because tying interferes with the photosynthesis process by blocking the channels that the sugars flow through to the bulb. Daffodils are referred to as Narcissus (the Latin botanical name) or Daffodils (the common name). The first recorded references to daffodils were around 300 BC. They were used for many years in Greek and Roman medicine. Today there may be as many as 200 different species and over 25,000 hybrids (known as cultivars); no one really knows. The flowers of the smallest daffodils are only 1/2 inch across and the largest stretch almost 5 inches across. The outer layer of the daffodil bulb as well as the foliage contains a toxic crystal substance, lykorine, which, if eaten, can be poisonous to dogs and other animals. This poison protects daffodils from animal predators, making it a good plant for areas where deer and rodents are known to cause problems. 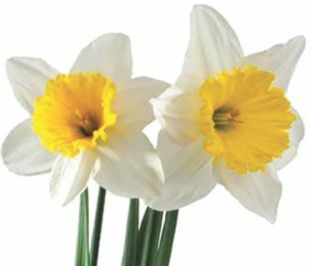 Even though the outer layer and other parts of the daffodil are poisonous, in 2010 scientists announced that a substance, narciclasine, found inside the bulb had therapeutic affects against aggressive forms of human brain cancers. A final word of caution, if you put daffodils with other flowers in a vase, you need to pre-soak the daffodils for 24 hours by themselves. This seals off the daffodil stem, otherwise toxic sap from the daffodil will cause the other flowers to wilt prematurely.